An estimated four million single-use propane cylinders are sold and used in California each year. 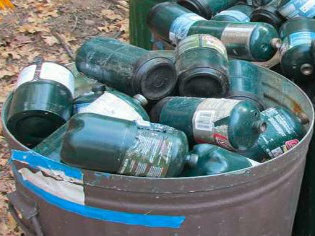 A campaign to rid landfills of small, disposable propane tanks is rolling out in California. It's called Refuel Your Fun - an effort to get people who use propane for things like small stoves, portable grills and lanterns to use environmentally friendly refillable cylinders. Christine Flowers is with the group behind the campaign, the California Product Stewardship Council. She says too many tanks end up in landfills. "The estimated numbers are four million in California annually, 40 million in North America, those are the disposable cylinders, the small one-pound," says Flowers. "So what we want to see is the exchange set up in the refills, just like you do with your barbecue-sized tank and your five-pound. That's the norm." This week U-Haul, the country's largest propane retailer, began offering refillable cylinders in California. They cost $11.95; refills are $1.95. Disposable tanks typically range from $4 to $7.